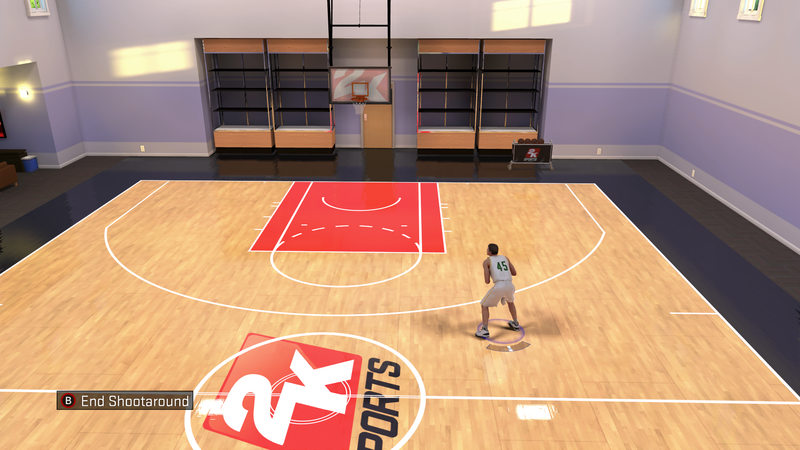 While the name might have sounded gimmicky, MyCOURT addressed an issue with MyCAREER in NBA 2K14: the lack of an area in which to shoot around with your MyPLAYER. With all of the different animations that you can purchase and equip for your player, this was definitely a necessity so that you could familiarise yourself with jumpshot and dribbling moves, as well as practice the controls and game mechanics. 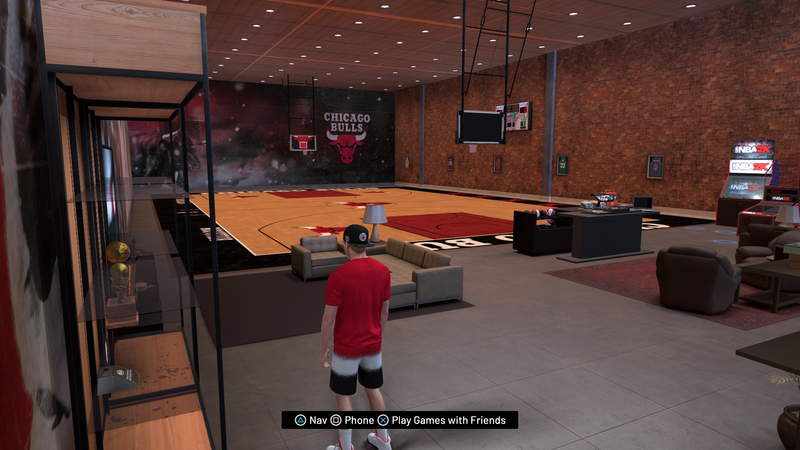 Obviously, there is a practice facility outside of MyCAREER, but it isn’t convenient, nor is your MyPLAYER available. To demonstrate its importance, it was years before NBA Live added a similar feature to The One, and it was definitely missed. The first version of MyCOURT was very straightforward, a basic gym with a Sprite vending machine and a few other background touches, with the floor design being determined by the NBA team you’re currently playing for. There are no customisation options, nor can you invite other users to shoot around with you. 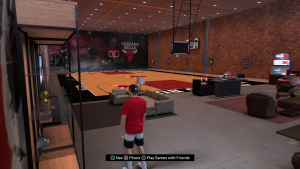 Nevertheless, it did serve as an attractive game hub, and the fact that it was an interactive environment put it well ahead of the background scenes of driving to the arena or flying on the team’s private jet between games in NBA 2K14. It was clear that it was much more than just a gimmick, instead becoming a well-received staple of MyCAREER moving forward. 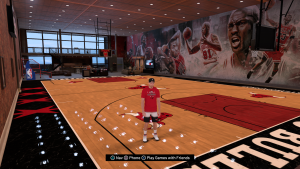 2K didn’t waste any time building upon MyCOURT in NBA 2K16. In addition to redesigning the environment, we also received the ability to customise the court itself. This meant that we didn’t have to be stuck with the practice floor of the team that we played for, but could instead brand the hub with the designs of our choice, from the floor to the backboard, and even the basketballs we shot around with! Of course, this came at a price, as customising our MyCOURT required the items to be purchased with VC. As with other cosmetic items, such as clothes for MyPARK, this meant we had to carefully budget our VC between ratings upgrades and court items. A key addition to MyCOURT in NBA 2K16 was the ability to invite friends to your court to shoot around, or play pickup games. This was also the method for squadding up to head to MyPARK, or the new 2K Pro-Am mode. Although straightforward, it wasn’t quite as convenient as being able to head to your Pro-Am squad’s arena, though it was arguably better than meeting up in The Neighborhood and squadding up for walk-on games. In the living area next to the court itself, you can sit down and watch a television, which broadcast 2KTV during the season. It could also be used to re-watch the story cutscenes after playing through the entirety of Livin’ Da Dream. 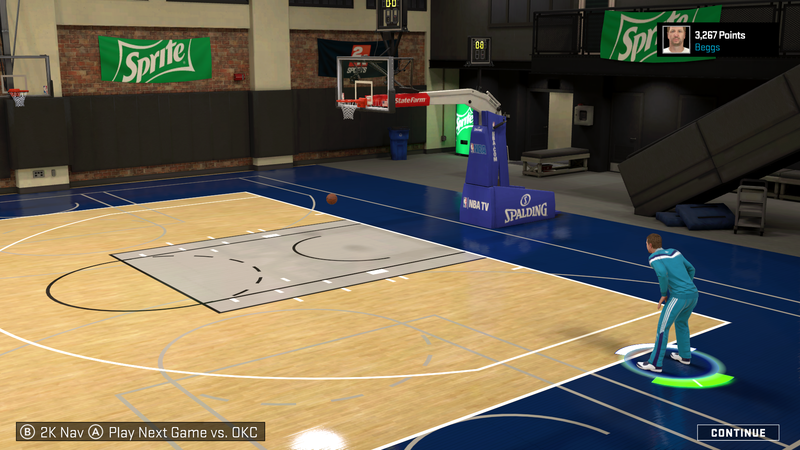 MyCOURT received another visual overhaul in NBA 2K17. Whereas the previous MyCOURTs were mostly comprised of the court with a few background details and the small living area in NBA 2K16, NBA 2K17 added a more fleshed out living space that included a kitchen area. 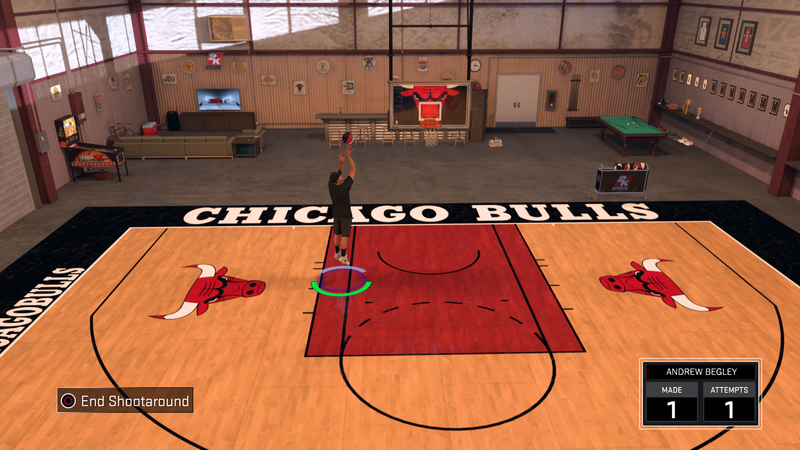 The default MyCOURT featured a warehouse aesthetic with retro NBA logos on the walls, a look that I quite liked. Your player would also enter and exit the door when going to or returning from games, training, and other events. 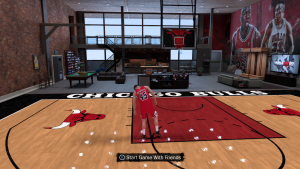 Teammates and other players that you made connections with would also visit your MyCOURT periodically, entering after the doorbell announced their arrival. 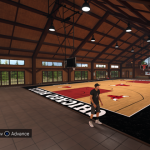 As you progressed through MyCAREER, earning fans and making connections with various players and brands, you could upgrade to two additional MyCOURT designs. The first was a lodge located in the serenity of the woods, while the second was a Jordan branded high-rise apartment with a view of the city. All three had an appealing aesthetic, and could be switched up along with the rest of the customisation options. 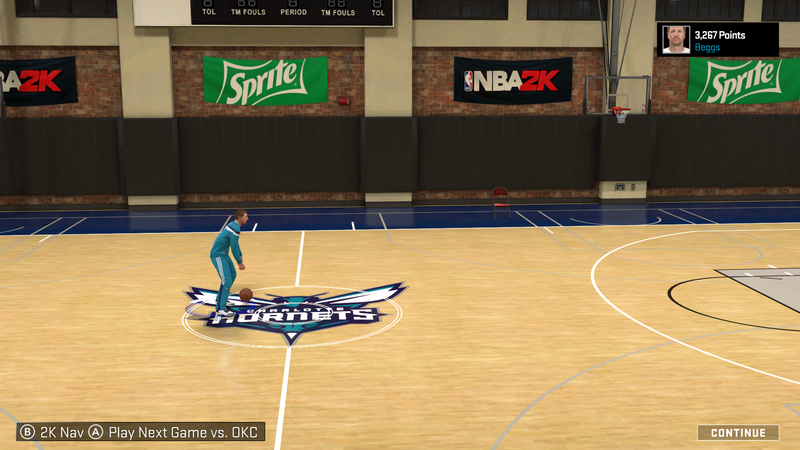 An overlay was also added displaying how many shots you’d made and attempted during a shootaround. This also filled your Doin’ Work meter for cap breakers, though the meter filled slower than in practices, and had to be reset by playing NBA games. 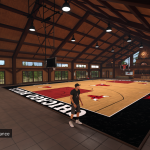 With the introduction of The Neighborhood, MyCOURT no longer served as the main hub for MyCAREER. Instead, it was a location that you could enter, attended by the new doorman character, Spinelli, who’s quick with the quips. Customisation items no longer cost VC, but you had to unlock the functionality by reaching 75 Overall on the Road to 99. All of the items were immediately available, however. 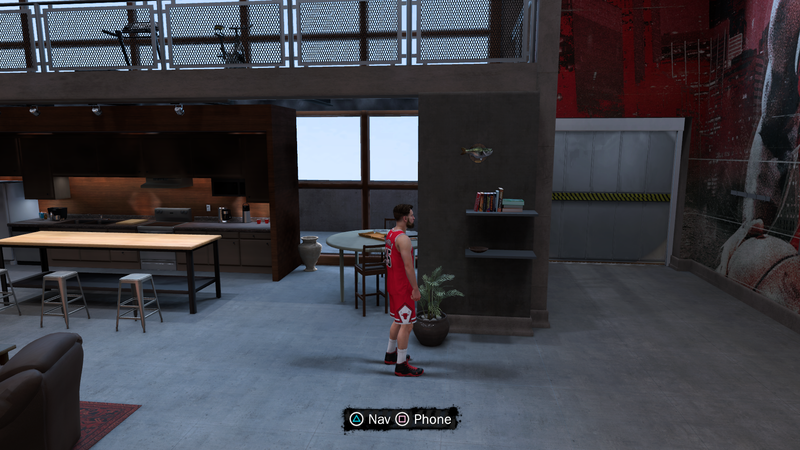 The new aesthetic introduced in NBA 2K18 was that of an expensive loft apartment with couches, a TV on which you could play exhibition games from within your MyCOURT, a pool table, ball rack, trophy case, shoe shelves, and a mezzanine area that was inaccessible. Your MyCOURT also housed the closet, where all of your unlocked and purchased clothing items were stored. While an immersive feature in theory, it was actually quite annoying, as you needed to return to your MyCOURT to change clothes; realistic, but cumbersome. By progressing through the story – which saw various cutscenes take place in your apartment, including several with the gratingly annoying B Fresh – you could also unlock a talking fish plaque, voiced by cover player Paul George. 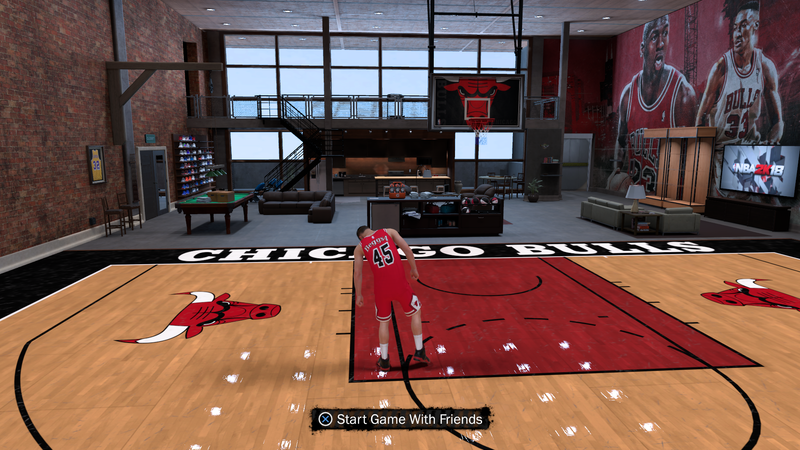 By far the best addition to MyCOURT in NBA 2K18 were the mini-games that you could play solo and with friends, including H.O.R.S.E., Around the World, and more. 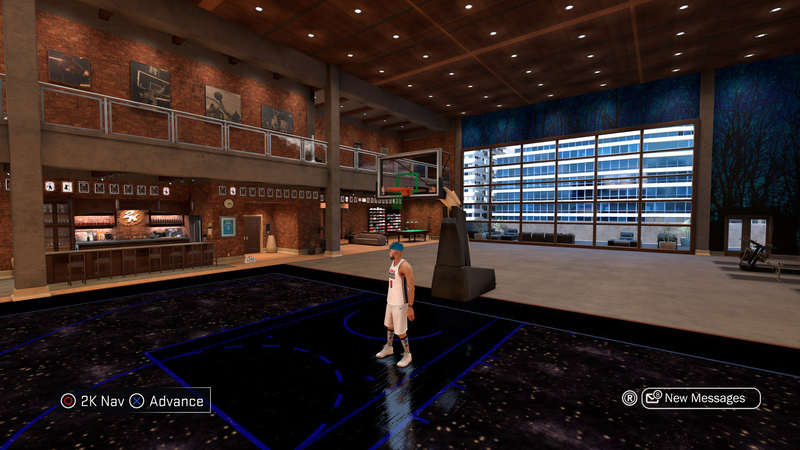 Interestingly, NBA 2K19’s MyCOURT retains the same basic aesthetic as in NBA 2K18, though the pool table is now gone, and exhibition games can no longer be accessed through the TV; you now need to unlock gaming machines by reaching 91 Overall. 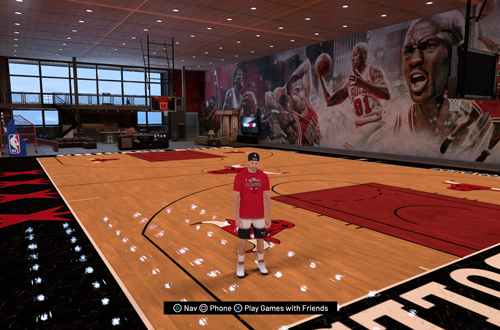 Thankfully, the closet has been removed, so we can now change our clothes at any time using the MyPLAYER menu. 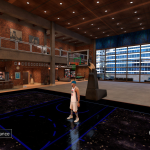 Court customisation is still unlocked via the Road to 99, though instead of unlocking all items, each milestone adds a new item beginning with the ball at 65, hoop at 70, scoreboard at 75, floor at 80, and NBA wall murals at 85. As I’ve noted, I believe they should all unlock at once in future games. Although he now has a different appearance, Spinelli is still the doorman. He’s still got a variety of lines including compliments for your recent performances, though as with other cutscenes in NBA 2K19’s MyCAREER, these can be skipped. Heading to your MyCOURT will also trigger various cutscenes that continue the story past The Prelude, with figures such as Shaquille O’Neal and Kareem Abdul-Jabbar entering your MyCOURT to give you advice. 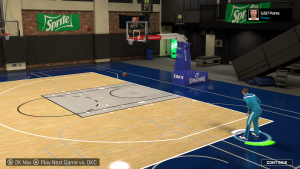 It can also be used to grind up to 500 VC in between NBA games by completing various objectives while shooting around, so it literally pays to make regular use of your MyCOURT in NBA 2K19! In terms of functionality, NBA 2K19 is probably the best MyCOURT to date. 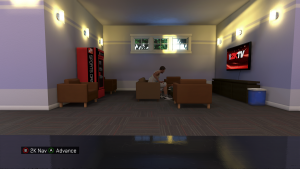 It has all of the mini-games that were introduced in NBA 2K18, offers a means of grinding some extra VC, and doesn’t make use of the closet to change clothing items. It’s also a decent design, though it’s a shame it’s basically identical to NBA 2K18, and requires a longer grind to unlock its customisation options. 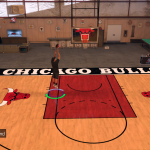 As far as the aesthetics of all of the MyCOURTs are concerned, from best down to worst I’d rank them as follows: NBA 2K17, NBA 2K18, NBA 2K19, NBA 2K16, and NBA 2K15. Ranking NBA 2K17’s individual options, I’d say lodge, high-rise, warehouse, though I do like all three. 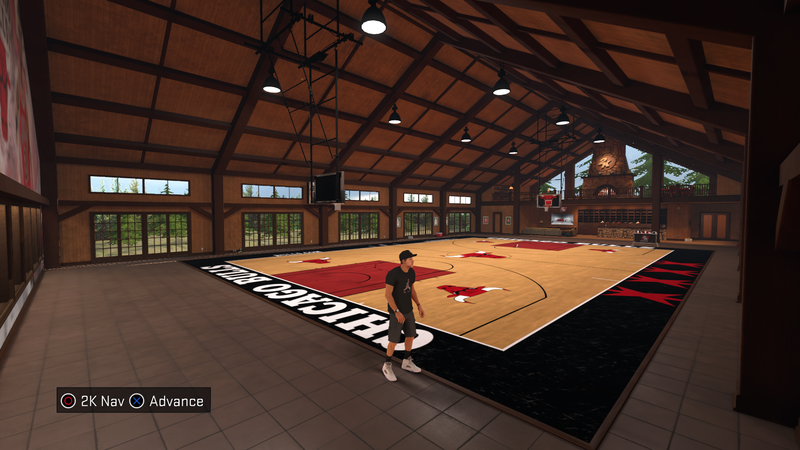 It may be overshadowed as a hub now that The Neighborhood attempts to provide an interactive game world to explore, but MyCOURT remains an important component of the MyCAREER experience. We need a place to be able to shoot around with our players, and the addition of mini-games allows us to take a break and have some fun with friends. Although we don’t really know how a custom jumpshot will work out until we play an NBA game or take it online, it’s a good place to get a feel for our animations. Even decorating it is fun, helping to personalise the experience. It’s a simple feature that may seem gimmicky, but it’s proven itself to be a worthy staple. 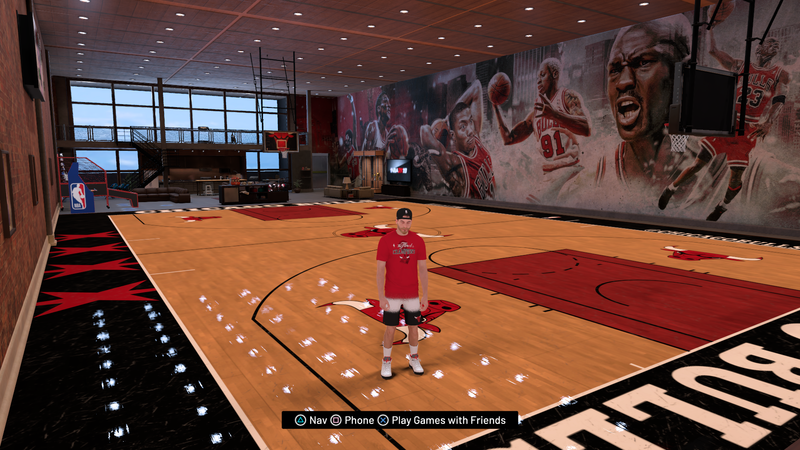 Special thanks to zzcoolj21 for the Jordan High-Rise screenshot!